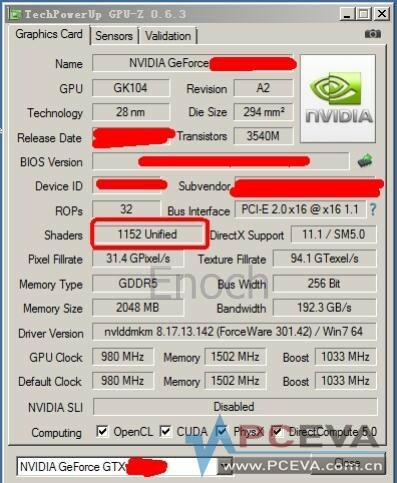 Leaked GPU-z shots from Chinese Microblogging site Weibo confirms that NVIDIA is atleast preparing two GK104 SKU’s, A GTX 660Ti and Non-Ti GTX 660. 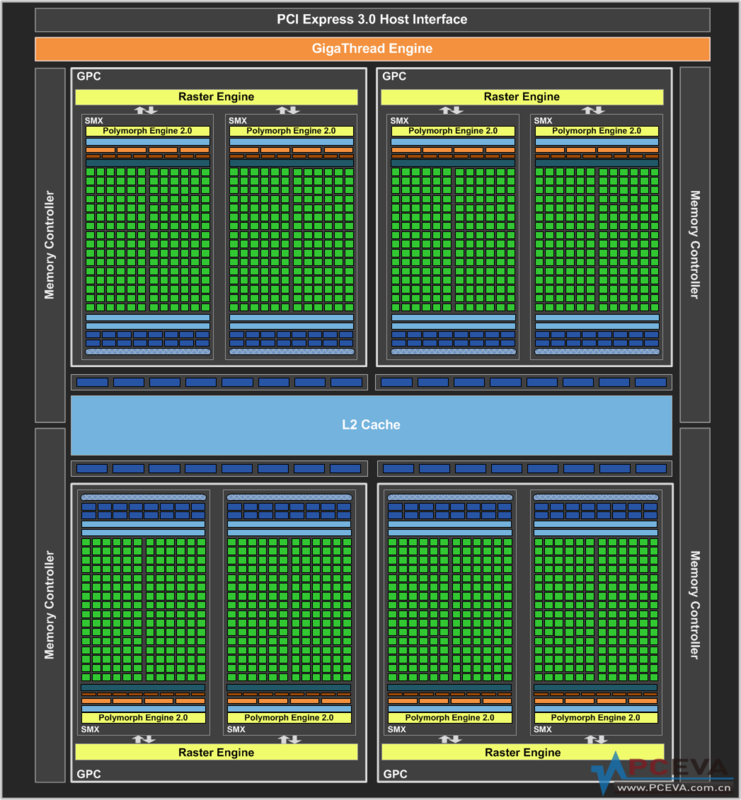 From the GPU-z shot which are currently said to be true from various sources, The GTX 660Ti would feature 1152 Cores, 256-bit 2GB Memory and is using the GK104 with 6 SMX units enabled. Core clock is maintained at 980MHz and Boost at 1033MHz while Memory is configured to run at 6GHz Effective resulting in 192.3 GB/s bandwidth. 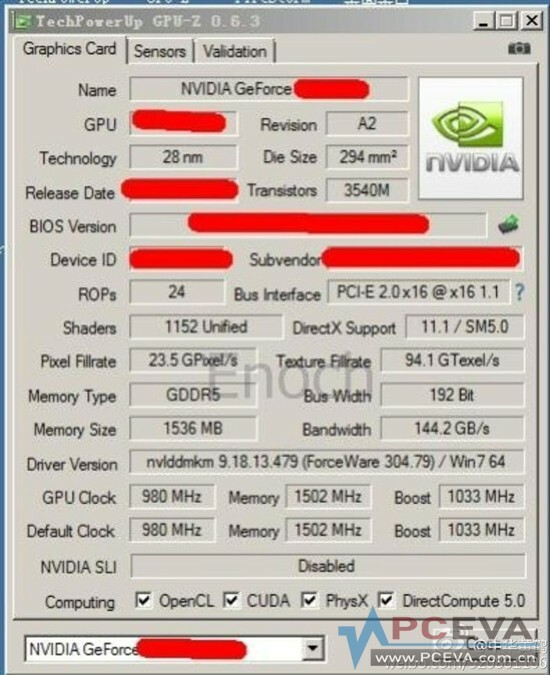 The second GPU-z shows what is alleged to be the Non-Ti GTX 660 which once again features 1152 Cores though it could be based on a different architecture since the user blacked out the GPU Core part however transistor count shows that it is the GK104 core. Nevertheless, The non-Ti part has a 1.5GB memory running along a 192-bit interface which in turn reduces the bandwidth to 144.2GB/s. Core clocks remain the same as the Ti part and memory runs at 6GHz effective. Talking about performance here, the 660Ti would be able to perform well against the HD 7950 with an expected 3D Mark 11 score of X2700 points while the 660 (Non-Ti) would performance equivalent to the Pitcairn based counterparts from AMD. Prices of the 660Ti go around $299 while the 660 (non-Ti) would be available for $229 or less, depends on NVIDIA.